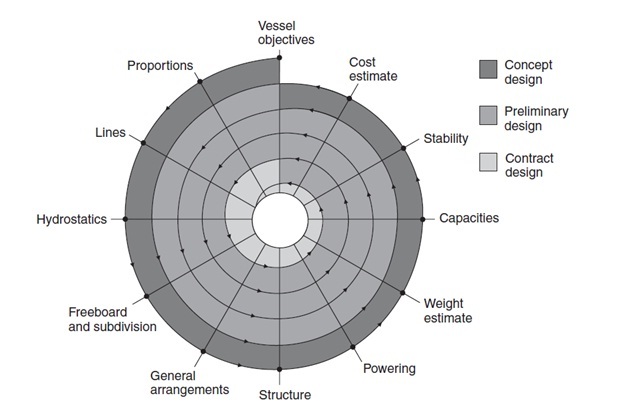 What are Factors taken into account during ship Building or Construction ? The dimensions are primarily influenced by the cargo carrying capacity of the vessel. In the case of the passenger vessel, dimensions are influenced by the height and length of superstructure containing the accommodation. Length where not specified as a maximum should be a minimum consistent with the required speed and hull form. Increase of length produces higher longitudinal bending stresses requiring additional strengthening and a greater displacement for the same cargo weight. Breadth may be such as to provide adequate transverse stability. A minimum depth is controlled by the draft plus a statutory freeboard; but an increase in depth will result in a reduction of the longitudinal bending stresses, providing an increase in strength, or allowing a reduction in scantlings. Displacement is made up of lightweight plus deadweight. The lightweight is the weight of vessel as built, including boiler water, lubricating oil, and cooling water system. Deadweight is the difference between the lightweight and loaded displacement, i.e. it is the weight of cargo plus weights of fuel, stores, water ballast, fresh water, crew and passengers, and baggage. When carrying weight cargoes (e.g. ore) it is desirable to keep the lightweight as small as possible consistent with adequate strength. Since only cargo weight of the total deadweight is earning capital, other items should be kept to a minimum as long as the vessel fulfils its commitments. In determining the dimensions statical stability is kept in mind in order to ensure that this is sufficient in all possible conditions of loading. Beam and depth are the main influences. Statutory freeboard and sheer are important together with the weight distribution in arranging the vessel’s layout. Propulsive performance involves ensuring that the vessel attains the required speeds. The hull form is such that it economically offers a minimum resistance to motion so that a minimum power with economically lightest machinery is installed without losing the specified cargo capacity.